Get the best deals online for all Active Autowerke Supercharger Kits for your BMW E46 or talk to one of our Modification Experts today @ 714-582-3330 today! 60,000+ happy customers! Active Autowerke gives you the power to fool dynos in thinking you're running an M3. Boosting your bimmer's power to over 100hp over stock. Specifically designed to run with 91-93 octane pump fuel and your stock engine management system, this system uses our dyno-tuned software adjustments to manage ignition, fuel, vanos, rev limits, speed governors, etc – all programmed into the same onboard computer your car was born with. Active Autowerke uses a Centrifugal supercharger that delivers sequentially more boost as it spins up to speed, not like a turbo. the Centrifugal Supercharger mechanically spins an impeller off a belt driven by the car's crankshaft. 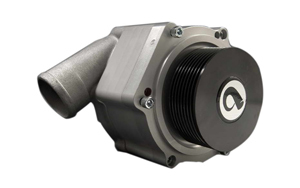 Basically, instead of compressing air with exhaust flow, like a turbo, the Active Autowerke Supercharger is compressing air as if it were a belt-driven turbo.